Petko Gruev Staynov Foundation .:. On November 26, 2017, at 11.30 am, the concert of the blinds "Music is light 2" will be held at the National Music School "Lyubomir Pipkov". It is organized within the framework of a project of the Petko Gruev Staynov Foundation, realized with the support of the Agency for People with Disabilities. The concert is dedicated to the International Day of People with Disabilities, which is celebrated on December 3rd, and which this year has the message "Transformation towards a sustainable and resilient society for all". The concerts will be attended by the compositions of the Mixed Choir of the Blind "Acad. Petko Staynov" and the Children's vocal group "Smileys" at Hight school "Louis Braille", as well as individual performers, present and former holders of the music scholarship" Petko Stainov "for blind students and students, funded by the American Foundation for Bulgaria. 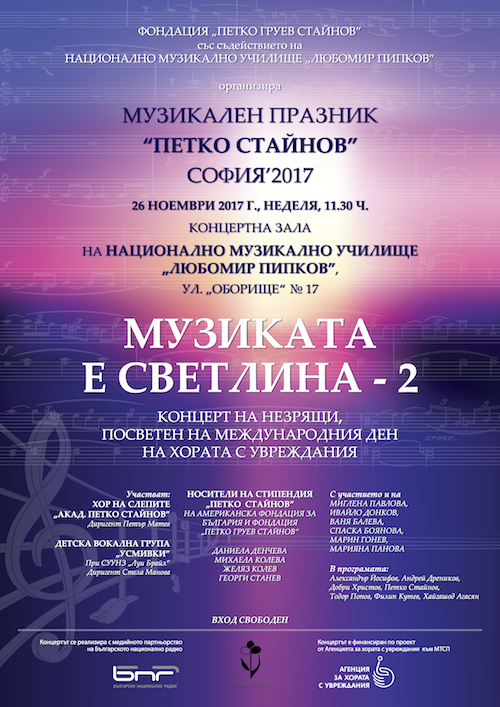 The concert "Music is light - 2" will be part of the National Music Festival "Petko Staynov" 2017, which will be held in the period 01-03 December 2017 in the town of Kazanlak.